Why choose Composite & UPVC exterior doors? Whilst all the doors in your home are important to your personal privacy, the external doors of your property are the most important ones in terms of front-line-security, and that includes both the front and back doors. Not only is the security that your external door provides important, the way it looks can have a large impact on the visual impact of your home. How energy efficient it is can determine whether you save, or waste money on your heating bills. That is why it is important to take your time to make an informed decision when choosing external doors for your property. To pick the best doors for your home, there are some things that you should have a working knowledge of in advance, and these will include design options, type of doors available, their main features and, of course, how much they cost. What are the key features of UPVC & Composite external doors? Firstly, it’s a probably going to be good idea to give yourself a primary objective before purchasing a new set of exterior doors. Coming to a conclusion about what matters most to you as a homeowner is one way to give you a place to start. Appearance: Is looking good at the top of the list, would you compromise on other features? Security: How concerned are you about these features on the door? Energy efficiency: Do you have to have the highest energy rated doors? Functionality: Do you want a sliding door, a folding door or a regular door? Cost: How important is pricing? Do you want the lowest priced door possible regardless of anything else? These are the just some of the factors that will influence the type of door that you eventually choose and also the purchasing / installation costs. What are the basic design choice for exterior doors? Of the designs for this category, you will be looking at either a solid door or part glazed door. Glazed exterior doors can be full length glass, the top half only glazed or glass panelled. All of the above have a particular design clue that is their key feature. For example, in the case of the stable style, the door is split into 2 (horizontal) sections, where the top half of the door can open independently of the bottom half. Cottage doors are rustic in their styling, whereas Victorian, Georgian or Edwardian are “period” styles. The door of 10 Downing St, home of the UK Prime Minister, is of a Georgian Style. The “odd-one-out” is the French door, which can be used also as a patio door (or even a window). 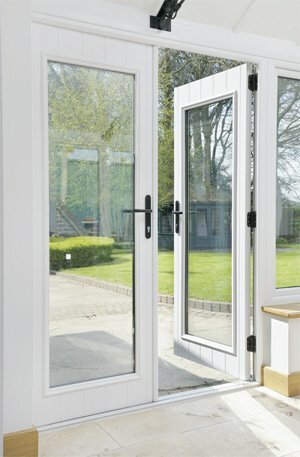 Installing a patio door is very popular in the UK, many times replacing the old back door entirely. Broadly you will be looking at 3 designs. Sliding designs have been around for many years, as have French. However, over the last few years, Bifold designs have shown an increase in levels of popularity, due mainly to their ability to move completely out of the way and leave a super-wide entryway. UPVC External Doors Vs Composite External Doors – which is the best? There are a lot of shared features with these exterior door designs, but there are some elements which can be seen to separate them from each other. The most important function of an external door is security. 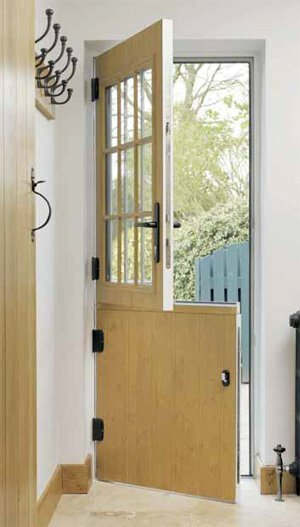 When picking an external door, you should think about the security of your home. Different types of doors will have different security features. For example, both UPVC & Composite designs have superior security qualities such as multi-point locks, dead locks, mushroom hooks & claws. You will also find them with 3 or 5 lever cylinder locks. Patio door versions will have anti-lifting tracks and feature heat tempered toughened safety glass. In this respect, both uPVC & Composite bring high levels of security. This is where your personal preferences come in. Do you want a modern look or a traditional vintage appearance? Style and appearance properties are mostly conditioned by the material of the door. Glass doors will give a different visual appearance than solid doors for example. The choice is based mostly on what you like and what you want to achieve. One great thing about style and appearance is that you can have customized doors made just for you. Both Composite and Upvc offer very similar products and neither one nor the other has a significant advantage in this area – both also have a wide range of colour options, including designs that have “timber grained” surfaces. However, when it comes to the timber-grain surface mentioned, composite front & back doors just look amazing. The colour for a uPVC door is a layered “foil” and, if heavily scratched can expose the underlying material. The outer GRP skin of a composite door is itself coloured, and therefore there is no underlying colour to expose when scratched. In this respect, Composite exterior doors win the battle. You should also consider thermal properties of doors before making a choice. Most modern doors have good insulation qualities, meaning they can keep heat in the house during winter and keep it outside during summer thereby cutting your energy costs. The availability of energy ratings for both products are very similar, both materials are highly insulating. In terms of energy efficiency, it’s a draw. As expected, different doors will have different installation protocols and maintenance requirements. Some doors require little to no maintenance, while some have specific cleaning protocols. Having said that, neither uPVC nor Composite will require high levels of maintenance. Just keep them clean. In terms of Installation and maintenance, it’s also a draw. There is very little difference once more between the 2 designs in this area. New Composite or uPVC exterior doors are built to last for many years, if you take care of them, you should get 30 years or more of service. Durability is legendary for both, they are tough products, not easily damaged by accident and very resistant to forced attacks. The minor drawback, once again, is for coloured uPVC external doors, which can show deep scratches. In this area, composite exterior doors have a slight edge over uPVC. How much do Composite and UPVC exterior doors cost? This is where the comparisons show a marked difference and the cost of Composite doors can be seen to be higher than that of UPVC doors across a range of designs. Your external door designs are unlimited. From the material you choose for your door, you can play around with the finishing, colour, doorknobs and more. The idea is to self-design a door that you will be happy to walk up to every time you head home. Door furniture – locks, handles, spyholes, hinges, weather strips etc. How much will a typical UK home external door cost you? The cost of your external door will largely depend on the properties of the door that you choose and the features that you install on the door. Things like additional locks, the finishing, glass panels, etc. will affect the total cost. 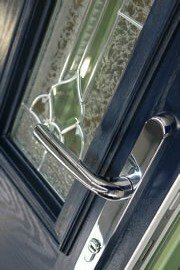 For example, a good quality, external, fully fitted uPVC Front door will cost around £500. How much do external front & back doors cost? How much do external patio doors cost? The influence external doors have on a home is incredible, they affect the way a property looks from the outside and play huge roles in the security of a property and the way a home consumes energy. So there is a lot to consider when picking an external door for your home, important features like security, energy properties, maintenance requirements and style play a major role in influencing your decision. The greatest part about all this is that you can definitely find a door that meets all of your requirements and have the home that you have always wanted. Based on what we have looked at, our conclusion as to “which is the best external door, uPVC or Composite”, we find ourselves favouring Composite doors just because of the timber grain finished products – they look amazing. 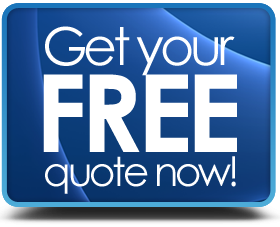 However, if you have a smaller budget, then uPVC exterior doors will do a great job for you.